We can do a great many things to preserve diseased teeth, from filling cavities to crowning damaged but still viable teeth to protect them and restore their attractiveness. But there may come a point where continued treatment just isn't worth it, and it may be time to remove and replace your troubled teeth. Dental implants have become the premier restoration for missing teeth. But they have some anatomical limitations and may not work for some situations like excessive bone loss or close nerve proximity. And while a removable partial denture is a solid option, perhaps you'd rather have a fixed solution. 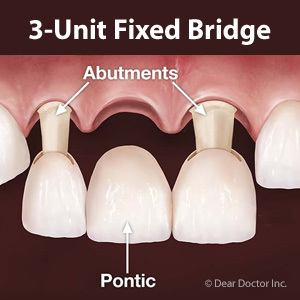 You might then want to consider a fixed bridge to replace one or more missing teeth. This tried and true option has been a mainstay in dentistry for several decades; and while implants may have surpassed them in popularity, they're still available and effective as a restorative option. A traditional fixed bridge is composed of three or more life-like crowns that are fused together like pickets in a fence. The crown or crowns in the middle fill the empty tooth space; the outside crowns fit over and are bonded to the natural teeth on either side of the empty space to support the bridge. These natural teeth must be reduced in size to accommodate the crowns to fit over them. Depending on how many teeth are missing, fixed bridges can be a more affordable alternative to dental implants and can achieve life-like results in both form and dental function. But the alterations required for the supporting teeth are permanent and can weaken them. The interface between the natural teeth and the bridge crowns has a higher risk of decay and periodontal disease, so you'll need to be extra vigilant with daily hygiene and regular dental cleanings and checkups. And even though implants can be more expensive in the short-term, they typically have better durability and less maintenance costs than other restorations. Over the long-term, an implant restoration might actually incur less cost than a fixed bridge. Still, a fixed bridge can be an effective way to replace missing teeth. Depending on your finances and your overall dental health, a bridge could help you regain an attractive smile.